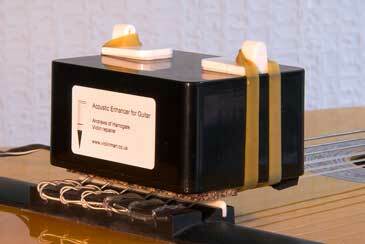 This is a device which attaches to the bridge of an acoustic guitar and vibrates, thereby exciting it. The theory is that extended periods of such vibration accelerate the ‘running-in’ of a new acoustic instrument which happens when it’s played. None of my acoustics are new, but since I have quite a few and therefore some don’t get played for several weeks at time, they can ‘go to sleep’ and their sound closes up. I first came across the idea of a vibrating device when I saw an ad for the US ToneRite product in the pages of Vintage Guitar magazine. It’s expensive and appears to work at quite high frequencies. After a bit more research, I found this one from a well-established violin repairer in Harrogate, UK. It’s mechanical and its intensity adjusts with the voltage put into it by the variable mains transformer supplied. In operation, it makes quite a bit of noise (it woke me up the other night!). Recommended running time is ca. 72 hours for a first use and then overnight ad-hoc as required. I’m hoping it will help me keep all my acoustics in ready-to-play condition. It’s early days but so far the signs are frankly quite remarkable – all the instruments I’ve treated to date have opened up dramatically, particularly in the lower-mid register. E, A & D strings chime like bells!